What is Boca Raton FC? We are a new, elite level, men’s adult amateur team that will play in the APSL. The American Premier Soccer League is a high-level adult men’s soccer league that will start play in May 2015 with 12 teams. The APSL has the aim of improving, qualifying and publicizing the soccer in the United States. The APSL is sanctioned by the Florida State Soccer Association (FSSA) as an affiliate of the United States Soccer Federation (USSF), the ruling body for soccer in the United States, and FIFA, the world’s ruling body for soccer. The APSL winner is also granted a birth in the US Open Cup. Who are the players going to be? We will be having open tryouts/trials in late March 2015. The rest of our roster will be comprised mostly of current and former local university players and the high-level amateur player from the Boca Raton / South Florida area. No, our team is open to the best players regardless of age. The APSL is an adult league so the level of play will be of high caliber. Generally speaking it is for those players 18 years of age and over. The 2015 APSL season will run from early May 2015 to late July 2015. Where will the team play and practice. Boca Raton FC will play all games and practice in and around the Boca Raton city limits. More details will be release at our official launch in April. Boca Raton FC is owned by a group of local investors and more importantly local soccer fans from the Boca Raton area. We are locally owned by people that want the best of our local soccer community. Ownership will be introduced / presented during our official launch in April. When will the team play and practice? All games will be played Saturday evenings during May – July. The team will practice 3 times per week, both during the day and in the evenings to accommodate all players. How far will the team have to travel to play? The APSL will have 12 teams in locations ranging from West Palm Beach in the north to Kendall in Miami to the south. Will the players get paid to play? No, no players will be paid to play for Boca Raton FC. We do have an official uniform supplier that will supply our players with all they will need. 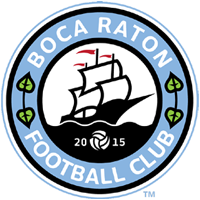 The official uniform partner of Boca Raton FC will be announced in April at the team’s official launch. Yes, there will be a minimal fee to play for Boca Raton FC. The player fee will cover: insurance coverage for club, facility usage, full insurance for each individual player, coaches, and also cover the annual league fees and travel costs. Who do I contact if I want to sponsor the team to an individual player? Simply e-mail us at: info@bocaratonfc.com – there are several options available to all sponsors. What sponsorship packages do you have available? Click here to find out more about sponsorship opportunities. How can I stay up-to-date with what’s going on with Boca Raton FC? We have set up many ways for our fans and players to stay current with what is happening at Boca Raton FC. Stay tuned to our facebook and twitter pages for information about the ownership, news, business partners, staff, jersey partners, sponsorships, stadium, and much more.